This appetizer is popular in Colombia, as are many other dishes cooked with Coke. We love savory and sweet combinations. 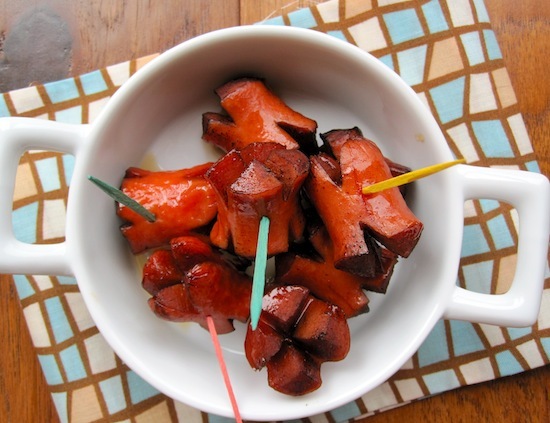 Salchichas en Coca-Cola (Hotdogs in Coke) are simple and easy to prepare and delicious, which makes them perfect for entertaining! Place the hotdog pieces and coke in a medium pot, over medium heat. Cook 35 to 40 minutes or until the Coke looks like caramel and serve. I never thought about this, but you’re right – it’s like molasses and brown sugar! Erica, first of all I love your website. Every time I come here I find more than one recipe I like. I will definitely try this one when having guests at home next time. This reminds me of a very simple recipe I have for sweet potatoes with coke. And, now I’m getting lots of other ideas too! This is a new one on me, Erica! Can’t wait to try it! This definitely sounds like a fun way to make hot dogs. Plus I just tried a sparkling bbq sauce made with 7up and the lightness that it brought to the dish. This sounds like it could be similar to that. P.S. Loved the way you cut up your hot dogs. Very cute! When I saw this post it brought tears to my eyes. My dad, whom I lost when I was sixteen, used to make these for me all the time. He used to call them aranas and serve them with popcorn. Truly a wonderful memory of mi papi. Thanks for posting this! I have had these before and also spare ribs…not a bad combo, I must say. I use it also when I make pernil (Puerto Rican pork roast) and the skin does not want to get crispy…just brush some coke on it…. What a fun little appetizer/party idea. They look delicious! I also grew up with these. They were a must at children’s birthday parties. I add some ketchup and mustard to the Coca Cola, it cuts on the sweet adding some tanginess to it. what an interesting phenomenon, and what a sweet, meaty taste it must have. i like this a lot, erica! Not something I would have thought of but “I get it” and bet it tastes good. I like the cuts you made on the end. It helps appearance and gives more surface area for the coke sauce to adhere to. Thank all for the comments! What an interesting combo and it definitely has me intrigued. I have never made this before but I love it! I hope you could add this coca-cola hotdog widget at the end of this post so we can direct foodista readers to your blog. Thanks! This may be a silly question, but do you cook the hotdogs in the Coca-Cola or cook them regularly in water first and then add them? Carson- You cook them in the Cola. I like that! We’ll have to try these soon! I make this recipe but add brown sugar (PANELA) to the coke. Try it is really good. Im wondering what to eat this with? 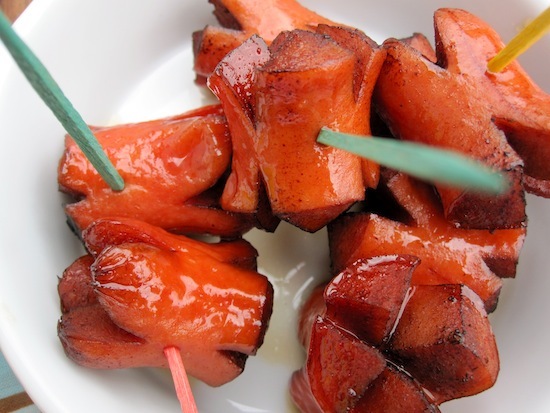 For example,what would complement the taste of the hotdogs with coke and turn this appetizer into a main meal? Also i have rice and pasta, im looking for how to make it so that it combines with the hotdogs to make a main dish. Thanks for your help! This is an appetizer, but maybe rice! I usually serve my chicken with coca-cola over white rice and it is delicious! Can you make this in a crockpot? What if I wanted to triple the servings? Do I just triple the ingredient amounts?